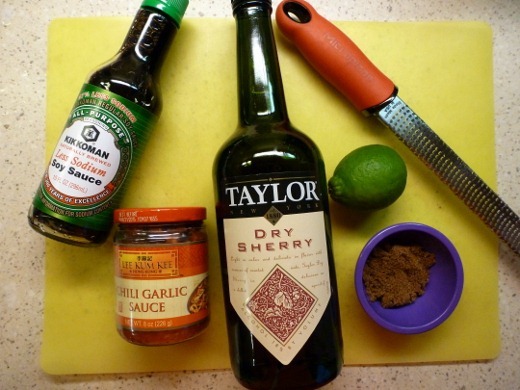 This is the third use I’ve found for that bottle of dry sherry I purchased in less than a month! It was most definitely worth it. I am now a big fan of cooking with it. This Asian noodle recipe also employs soy sauce, chili garlic sauce, brown sugar, and lime zest and juice. I’m telling you, this 3 pound bag of limes I recently purchased are just about the least-juicy citrus ever. I’m telling you. I needed to cut into second lime to get my full two tablespoons. Weak. 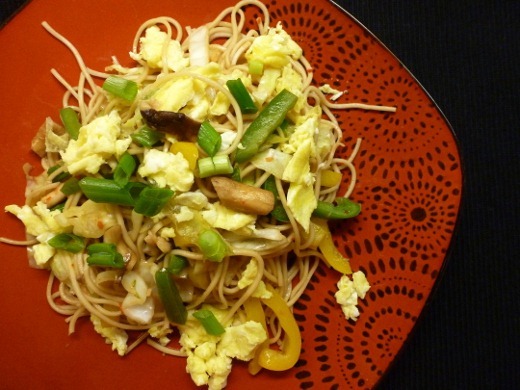 As far as the noodles go, the recipes suggests using spaghetti or lo mein noodles. 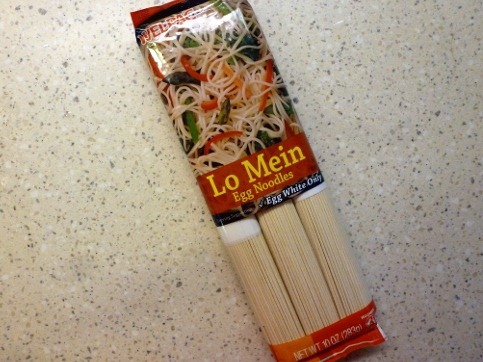 I have cooked with these particular lo mein egg noodles in the past and really like working with them. And they are tasty! A vegtastic meal. 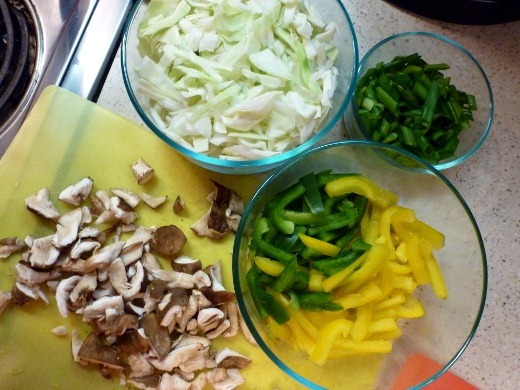 Sliced shiitakes, green cabbage, green and yellow bell peppers, and scallions. Sauté action. Cabbage is another ingredient with which I’ve also really enjoyed getting in the habit of cooking over the last few months. It’s adds volume to dishes without adding many calories. 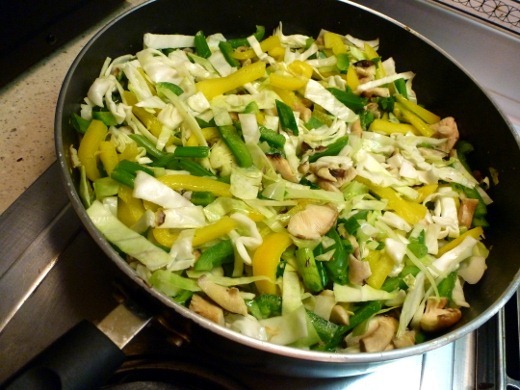 Cabbage is also a very good source of fiber, vitamins C and K, and folate. 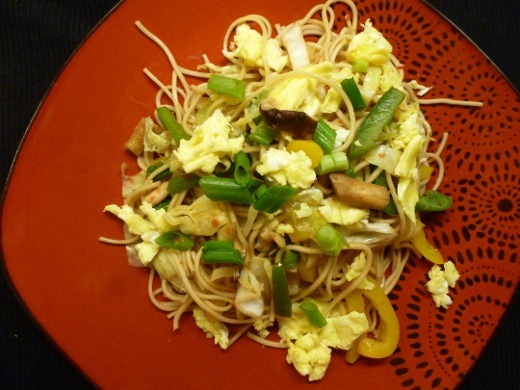 To amp up the protein content of this dish, I cooked a few eggs in a skillet, kind of like an unfolded omelet, and then sliced the cooked egg into strips to place atop the finished noodle dish. These Chile-Lime Veggie Noodles made for a fast and easy Meatless Monday! Pingback: Green Beans with Sherried Mushroom Sauce | Meg.Goes.Nom.Nom.